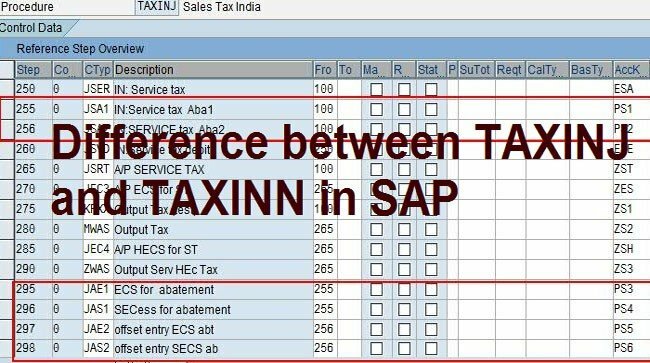 How can we check for Country India the tax procedure used is TAXINJ or TAXINN in SAP ERP system, where TAXINN is condition based and TAXINJ is formula based. For GST Tax procedure TAXINN should be there in the SAP System. You need to verify the tax procedure used for Country India in your system is TAXINJ or TAXINN by using below checks. You need to check in the transaction code OBQ3 whether the field "Condition formula for alternative calculation type" has been maintained for the excise condition types or not. If the same has been maintained for the excise conditions, then the tax procedure used in the system is TAXINJ as it uses alternative formula that determines a condition. Where as in the TAXINN conditions are determined using condition records maintained via transaction code FV11. Similarly you can check on the SD pricing procedure as well, there should be no formula used for the excise relevant conditions. You must check that the condition value/rate which is getting fetched in the PO should be from J1ID (Excise Mater) / FTXP for TAXINJ whereas for TAXINN it should be directly from the condition records maintained via transaction code FV11. Procedure is TAXINJ, if the standard access sequence MWST (or copy of the same) which contains only one standard condition table A003 for condition access has been assigned to the excise condition types. For TAXINN, excise condition types must be having the standard access sequence JTAX (or copy of the same) which contains multiple standard condition for condition accesses. Access sequence and condition table can be verified in the transaction code OBQ2. The Company code and tax code for purchasing documents should be maintained in the table J_1ICONDTAX in the case of condition based technique i.e. usage of the TAXINN procedure. For TAXINN procedure all the excise/VAT/CST/service condition types should have been classified in the table J_1IEXCDEFN with the unique condition names. There should be no condition type UTXJ in the TAXINN set of SD pricing procedure, as this is only used in case of TAXINJ for the base and rate determination for condition types. Read more here about Indian Tax Procedure Migration from TAXINJ to TAXINN.